Researchers from the University of Ottawa and The Ottawa Hospital have developed a promising targeted strategy to treat chemotherapy-resistant acute myeloid leukemia (AML) and a diagnostic test to determine which AML patients would most likely benefit from this treatment. In a mouse model, the experimental treatment eliminated all signs of disease (complete remission) in 100 percent of animals, while those that received the standard treatment all died. The results are published in the leading cancer journal Cancer Discovery. Dr. Stanford’s research focuses on a protein called MTF2, which places chemical tags near certain genes to help control their expression (called epigenetics). Dr. Stanford previously found that MTF2 plays a role in blood development. 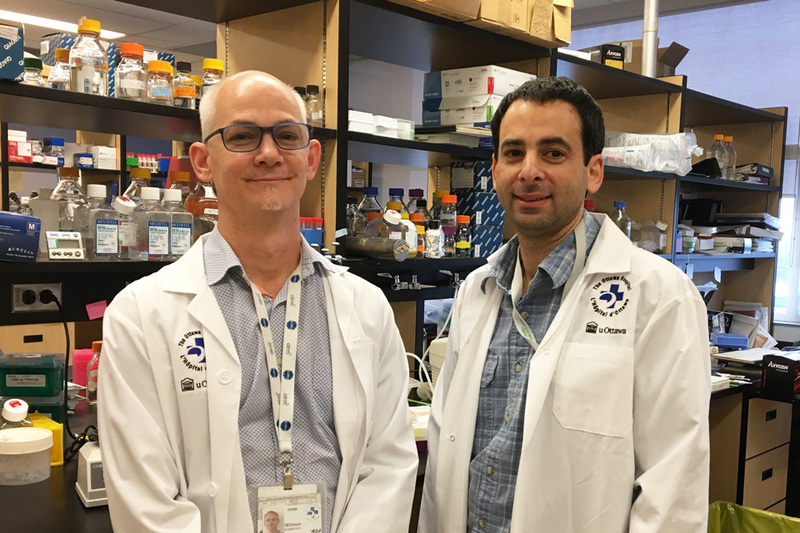 He then teamed up with Dr. Mitchell Sabloff, a hematologist at The Ottawa Hospital, to see if it also plays a role in blood cancer. 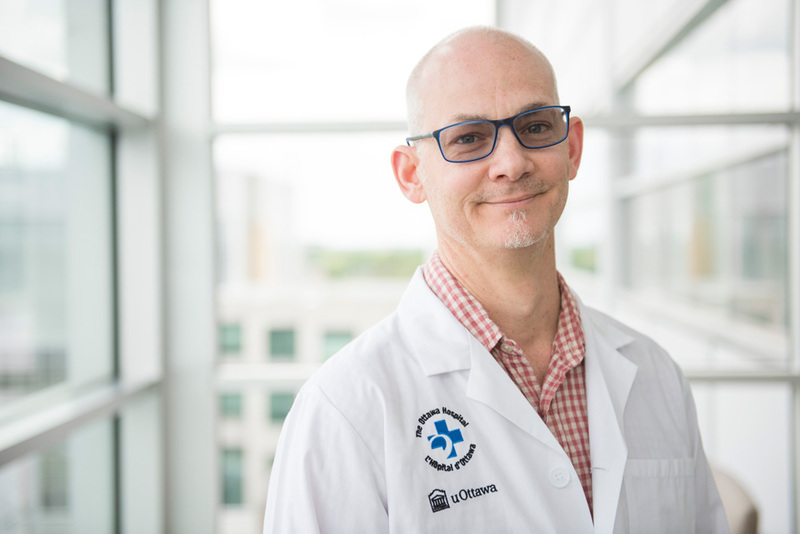 Dr. Stanford and his colleagues then discovered that MTF2 helps to place a chemical tag near a gene called MDM2, which is known to help cells resist chemotherapy. In AML cells with normal MTF2, this tag lowers MDM2 levels and ensures that cells die when they are damaged by chemotherapy. On the other hand, AML cells with low MTF2 can’t put tags on MDM2 to decrease its expression. These cells keep on living and dividing even when exposed to high levels of chemotherapy. Acknowledgements: This research was possible because of generous donations to The Ottawa Hospital. This study was also supported by the Canadian Cancer Society, the Canadian Institutes of Health Research and the Cancer Research Society. Dr. Stanford is part of The Ottawa Hospital’s Regenerative Medicine Program, which includes the Sprott Centre for Stem Cell Research and the Sinclair Centre for Regenerative Medicine. He is also part of the University of Ottawa’s Department of Cellular and Molecular Medicine. Dr. Stanford holds a Tier 1 Canada Research Chair in Integrative Stem Cell Biology. He is also a member of the Stem Cell Network, the Ontario Institute for Regenerative Medicine, the Ottawa Institute of Systems Biology and the Ottawa Centre for Epigenetics Research. The researchers used the following core research resources at The Ottawa Hospital: StemCore, Flow Cytometry, Bioinformatics, High Content Imaging. They also used the hematology bio-bank at The Ottawa Hospital, which has been supported by Celgene, Roche and Sanofi Lundbeck. This is an example of how hospital-based research makes Ontario Healthier, Wealthier and Smarter. Dr. William Stanford (left) and Dr. Mitchell Sabloff.